So. My family and their garsh-durned wacky cookie traditions. Actually, this one is not. It’s quite seasonal with flavors appropriate to Christmas. And it is good for the new year because it has the property of being less unhealthy than a lot of sweets. It is also the simplest, easiest thing to make. These cookies only have egg whites, so it’s got a lot of protein without the fat of the yolks. If you eat the whole batch. Which you might since they are quite light and ultra mega-addictive. To the nth degree tasty. However, eat that whole batch and you are going to get a wicked dose of chocolate. This chocolate might bring you dreams. Good ones of happiness, health and prosperity in 2012, I hope. I’m trying to think of a more imaginative angle to take on these cookies beyond health and hallucinatory properties but I’m coming up short. I guess health and hallucinogens will have to do. Anyone else get crazy dreams when they eat a lot of chocolate before bed? Grind up candy canes to equal one half cup. You can use a blender, or as I’ve done in leaner years, just put them in a double layer of sandwich bags and beat them with a hammer. Works out the tension. Whip egg whites to soft peaks, then gradually add sugar as you beat to stiff peaks. 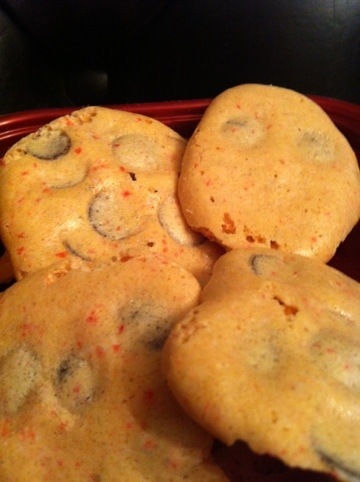 Stir in candy cane dust, fold in chocolate chips. Preheat oven to 350. Line baking sheets with that nonstick foil if you have it but regular foil works too. Just don’t grease it. Dollop the meringue onto the sheets. When the oven reaches 350, put the cookies in, turn the oven off and leave overnight, or at least 8 hours. Eat before bed the next day and see what visions the chocolate brings. Minty fresh ones, hopefully.